The program started with the rousing Big Band number Prelude, Fugue and Riffs (1949/Rev.1955) dedicated to Benny Goodman. It was Bernstein at his toe-tapping best; the piece started in a quasi-serious mode with a Prelude and a Fugue, and let loose in the jazzy Riffs that saw the orchestra and audience swinging to the music and the ebullient clarinet playing of LA Phil’s new principal Boris Allakhverdyan. It ended in a blazingly brilliant crescendo not unlike Ravel’s Boléro. The Three Meditations from MASS (1977), so magnificently staged at the Disney Hall a few months ago, were a somber work for cello and orchestra. In 2001, I had the opportunity to meet and briefly chat with its dedicatee, Mstislav Rostropovich in Cerritos, CA following a concert of Haydn and Saint-Saëns by the Pasadena Symphony. The maestro mentioned the Meditations from Mass as one of the great American works he had played and what a great guy Lenny was. 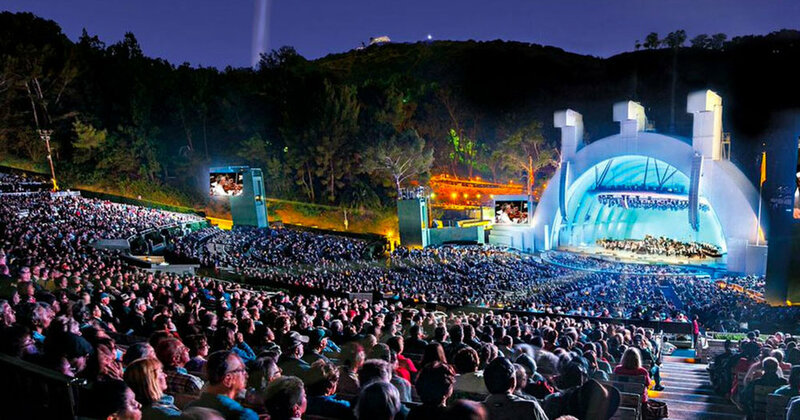 At the Bowl, 24-year-old French cellist Edgar Moreau played the piece with quiet eloquence and emotional restraint. Dudamel conducted the orchestra with the same finesse that he did for the staged Mass. We then moved on to Bernstein as the musical theater composer, although the line between musical theater and opera becomes blurred with West Side Story (1957). TV actress Sutton Foster and Broadway veteran Brian Stokes Mitchell made a delightful, winsome couple in musical numbers from On the Town (1944) and Wonderful Town (1953). Conductor Dudamel also let his hair down and loosened his bowtie to get into the spirit of these songs. The concert ended with the ever-popular West Side Story Symphonic Dances (1961) containing all the greatest hits from the musical (minus “America”) in a masterful symphonic development. Its nine sections could be organized into the four movements of a symphony: Allegro-Scherzo-Andante (“Meeting Scene”)-Allegro Finale. Bernstein’s genius and ease of moving between the popular and serious media are nowhere more apparent than in the score of the West Side Story. This concert was a truly meaningful tribute to America’s most-beloved composer-conductor-educator. Happy 100th Lenny!